If your dorm is going to be anything like mine, the overhead light will be your absolute LAST resort for lighting. It looks like the true jail cell it is in my room when we turn that on. A small desk lamp with warm lighting is a great, calming source of light for doing homework, writing in a journal, or even eating snacks (as I often do) at your desk. I got a simple white one with a gold stand from Target for around $10, and it matches everything I could think of. As mentioned previously, you want warm, inviting light to cover up the fact that you live in a 5x10 box. String lights look super cute at night and give a nice warm light to your room. My roommate and I have ours on 24/7. I got mine at Target during the late spring. Go as early as possible, they have limited options in the late summer and don't re-stock until closer to Christmas. Both my roommate and I are coffee drinkers, and we both love having a Keurig in our room. I originally thought we could go without a coffee machine, but we save SO much money making coffee in the morning and bringing it to class. We just have a single-serve machine and it fits perfectly in our small space. Having an under-the-machine storage drawer is super convenient and all of your coffee is right where you need it. I got mine off of Amazon and it works great. A lot of people place their TV on top of a desk or a wardrobe, or even on top of their mini fridge. I brought a 4-square storage unit that you can put bins into, and this has been one of the most helpful items we have in our room. We use one bin for cleaning supplies, one for snacks, and one each for extra towels, sheets, and other items. These are a great way to get more storage in a small room. My clip fan is the only reason I sleep well in a bunk bed. It drowns out noise from the hall and keeps me cool while I'm sleeping. I highly recommend picking one up for your room. I got mine at Target for around $10 and I use it every single night. This is definitely not something you need but is an item I find useful and makes life much easier. My dorm has community bathrooms, so I do walk the hallway to get to the shower. Having a towel wrap keeps my hands free to carry my shower items, my keys, and anything else I'm taking with me. I just got a plain color because mine hangs out in the open like a robe, but a fun color or pattern is always a good choice. This is where I keep all the blankets I brought and never use, extra items that don't fit anywhere else, and things I don't want to leave out. I also use it as a bed-side table for my water at night, and it has a pocket for our remotes which is really convenient. If you can find one with side pockets and other storage, I would recommend you buy it. YOU WILL NEVER HAVE ENOUGH OUTLETS!!! Buy 3-4 power strips, you will thank yourself later on. My roommate and I have one plugged into every single outlet we have. Maybe it's just because we live right next to a dining hall, but our dorm sometimes gets funky smells. It also can smell super musty in the winter when you can't open the window. I brought an air freshener, and it has made a world of difference. I got mine from Bath & Body Works and have been really happy with it. Some favorite scents we've tried are Marshmallow Fireside (smells super nice and the smell is strong and lasts) and Mahogany Teakwood. Your closet will never be big enough for all your clothes. Especially if you have a wardrobe like I do. Buying hanging organizers saved my space by allowing me to stack clothes vertically. I use it for t-shirts, workout tops, and jackets that I don't wear that often. I also have jewelry organizers I hung on the insides of the doors of my wardrobe. Those have been a lifesaver in terms of keeping my jewelry organized and untangled. There are a couple of things I bought thinking they would be very useful that I never use at all. Don't spend money on these items, or buy the cheapest version you can find. In my opinion, these are things you can do without. Check if your dorm has a water fountain. It probably does. We literally never use our Brita jug because it's not even worth it to fill it. We used to use it as a pitcher for the coffee pot but it's more annoying to wait for five minutes while it fills than it is to just take a coffee cup to the drinking fountain. Don't waste money on this!!! To be honest, most of the time I use the full-length mirror to do my makeup just because it's quicker than sitting down to do my makeup. Sometimes I do my makeup in the bathroom, too. Especially if your dorm has a sink and a mirror, don't buy one of these or get a cheap one. I think I've used mine 10 times the whole year. Your dorm will be smaller than you think. I brought a few too many things to hang up on the wall, and it ended up just being cluttered. Bring a big bulletin board for your pictures and one or two art pieces to hang up and that should be good! 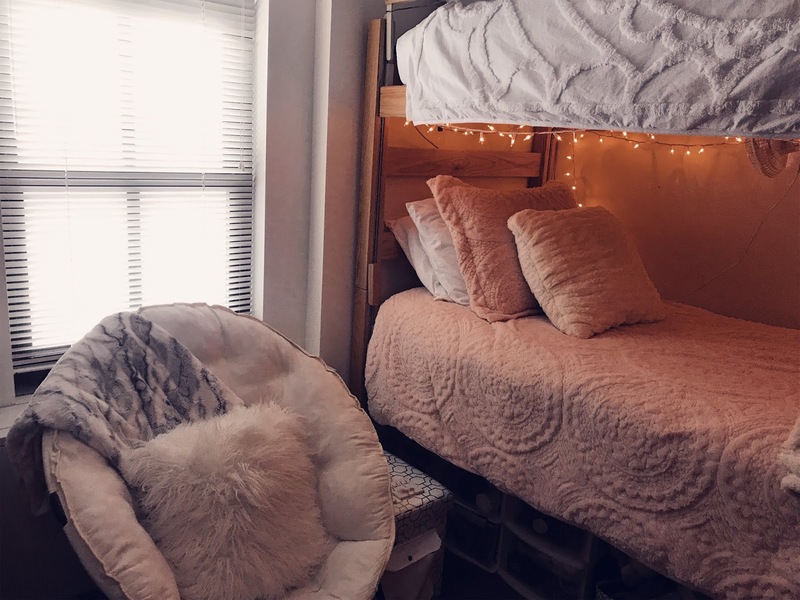 Your roommate will need to hang stuff as well, so it's better to be minimal and add to the walls later if you feel like it. I have one bulletin board and two drawings hanging up and I think it's the perfect amount. I'm too busy to keep my drawers neat and organized. The organizers just annoy me, so I barely even use them. Especially if you're buying acrylic ones, this is a lot of money for something that doesn't do a ton of good. My desk drawers are crammed FULL because we don't have a lot of storage space for things like school supplies and personal items. Just organize your things in a way that makes sense, it will save you some money!! I brought a million blankets with me to school and I literally only use one of them. Invest in one big, fluffy blanket and that's all you will ever need. Maybe bring one more that you can use outside or you don't care about getting dirty just in case.